It´s not the Caribbean, it´s Crete! Hehehe, in my opinion, one of the best beaches in the Mediterranean. It is to the south west of the island of Crete and its crystal clear water, the amount of fish that run through your feet, the fact that you have to wade deep into the water for it to cover you and that it is a virgen beach (no buildings around) make it a magnificent beach. The beach consists of two sandy areas separated by a tongue of water that reaches the knees. A must-see if you go to Crete. 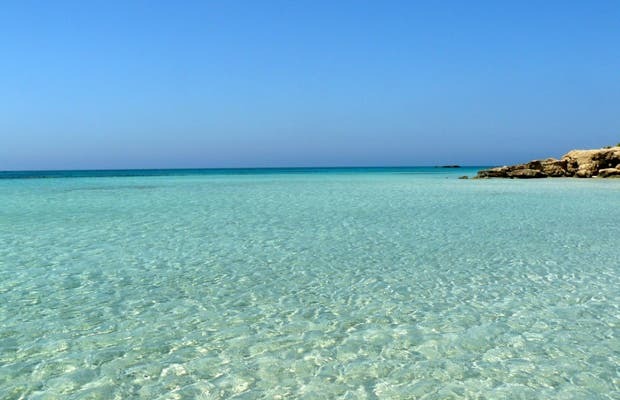 Unspoiled beauty of Libyan Sea, red-pink sand, turquoise waters, Cretan exhilarating fresh air. If you can endure the pain of driving under quite driver-unfriendly circumstances in the Cretan countryside, that is the place to be! Small island at the end of the Peloponnesos. Clean white sand beach and no crowds.